Although The Punisher was created in the 1970s, Jonathan Hensleigh -- writer and director of the upcoming Punisher movie -- said the is a character of modern times. "I think that questions of justice and the morality of acts of revenge or retribution are certainly on people's minds these days," Hensleigh said. "As a filmmaker, I personally don't take a stand one way or another. But I was very watchful towards setting rules for the character, which the comic book does a good job of doing. "If a person seeks a life of vengeance, if you will, on behalf of society, then he'd better have some hard, fast rules. Castle's are that he will only go after those individuals who he absolutely knows, beyond a shadow of a doubt -- or who society has judged, beyond a shadow of a doubt -- have committed heinous acts. He's not wanton in his vengeance." Hensleigh's movie is influenced by the "Welcome Back Frank" story, which he read in one sitting. "It happens very infrequently in your career, where it's just like a light switch is thrown," he said. "You know you�re right for something. I got on the phone, called up Marvel and said, 'I'm committing to this.' It quite literally was that simple." Hensleigh enlarged the roles of Castle's tenement neighbors, Joan, Dave and Mr. Bumpo, who appeared in the Welcome Back Frank series. "They're all broken people. Castle is a broken man. He heals them; they heal him," Hensleigh said. "Through the softening and humanizing effects of this new surrogate family, and the fact that he had to come to their aid -- because these are people that he cares about -- he realizes that he has a broader role after the vengeance of his family is concluded." 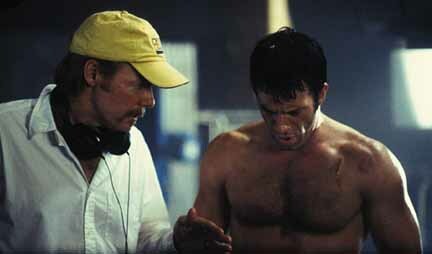 Hensleigh said that he and star Thomas Jane shared the same vision for the character from their first meeting. "Tom and I decided to play a great deal of the character's emotion silently, or with very little dialogue," Hensleigh said. "Most of the pictures that we loved from our youth were anti-hero pictures with stars like Clint Eastwood, Steve McQueen and Charles Bronson. They�re not verbal roles. Those stars consistently played men who were so broken-down that they were unable to articulate what was really going on with them emotionally." Cable network Sci Fi on Monday announced it is developing Mike Mignola's Amazing Screw-On Head as animated series. "Adapted from the critically acclaimed, Eisner Award winning comic book by Mike Mignola (Hellboy), Amazing Screw-On Head is a half-hour animated comedy based on the exploits of one of history's unsung heroes. A secret agent who never made the history books, Screw-On Head is in the employ of the U.S. Government. A robot that screws his head onto a wide variety of bodies, Screw On Head battles those who threaten our civilization." Bryan Fuller and Jason Netter will executive produce. Fuller will be writing and Netter, of Kickstart Productions, will oversee animation. The network also announced the Shawn Ashmore of X2 and Kirstin Kreuk of Smallville will be starring in the event movie Earthsea, and that it is working with Stan Lee on three new movies. Oni Press is releasing The Tomb, a 152-page black-and-white graphic novel written by Nunzio DeFilippis and Christina Weir with art by Christopher Mitten, on July 7. "In 1922, Lord Earl Carnarvon financed the Egyptian expedition that unearthed King Tut's tomb. While the fact that the dig gained a reputation for being 'cursed' is well known, Mathias Fowler slipped away into anonymity. Fowler, an American on the team, had grown obsessed with the Ancient Egyptians and when he returned to the States it was with several stolen artifacts in tow. Fowler had become so consumed by the era that when he died, he killed all of his household staff and had them buried in his mansion with him--a modern day Pharaoh's Tomb. Almost 60 years after Fowler's death, Jessica Parrish, archaeologist and would-be-adventurer, has been hired to assemble and lead a team into the house to take back the missing pieces and disable the booby traps that have already cost one unfortunate group their lives." "Nunzio and Christina are on their fifth project for us," said editor James Lucas Jones, "and this is the first time they've come anywhere near repeating themselves genre-wise. Even now, while The Tomb shares some horror and thriller elements with the duo's first project, Skinwalker, that book had more of a procedural, mysterious feel. "The Tomb is more in line with the haunted house sub-genre with a good helping of pulp adventure thrown in. If Skinwalker was 'X-Files on the reservation,' The Tomib is 'Indiana Jones in the haunted mansion.'" "This is a project that couldn't really work without the graphic novel format," Weir said. "The pacing just wouldn't have been the same in a serialized publication. The twists and turns and decapitations would have been dictated more by the twenty-four page chapter length than the story. The longer-form OGN is a more ambitious project to be sure. 140-plus pages is a lot to draw for a single publication, but we're excited to be doing this project the way it needed to be done and we're excited to be doing it with Chris." The Tomb will cost $14.95. The WB has released four images from "Underneath," the new episode of Angel scheduled to air on Wednesday, April 14. "Hoping that Lindsay (guest star Christian Kane) has information on the Senior Partners' ultimate plans, Angel (David Boreanaz), Spike (James Marsters) and Gunn (J. August Richards) track him down in a bizarre and terrifying suburban hell. Meanwhile, a nearly invincible stranger (guest star Adam Baldwin) sent by the Senior Partners, infiltrates Wolfram & Hart looking for Eve (Sarah Thompson)." "Underneath" was written by Sarah Fain and Elizbath Craft and directed by Skip Schoolnik. "Red" is the episode of Smallville: The Beginnings set to air on Sunday, April 18 on The WB. Carl Gustav Horn has joined the Dark Horse Comics staff as a manga editor. 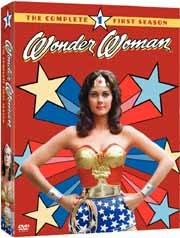 * For Wednesday, March 31, including Wonder Woman DVD news, CLICK HERE. * For Tuesday, March 30, including The Batman animated news, CLICK HERE. * For Monday, March 29, including Punisher movie news, CLICK HERE. * For Saturday, March 27, including Elektra, Hellboy and Punisher movie news, CLICK HERE. * For Friday, March 26, including Justice League Unlimited news, CLICK HERE. * For Thursday, March 25, including Marvel news, CLICK HERE. * For Wednesday, March 24, including DC first looks and Hellboy movie news, CLICK HERE. * For Tuesday, March 23, including an interview with John Singleton, director of the Cage movie, CLICK HERE. * For Monday, March 22, including coverage of Spider-Man 2 and Punisher panels at Wizard World Los Angeles, CLICK HERE. * For Sunday, March 21, including Wizard World Los Angeles coverage, CLICK HERE. * For Saturday, March 20, including Marvel Comics' solicitations for June, CLICK HERE. * For Friday, March 19, including Image Comics' solicitations for June, CLICK HERE. * For Thursday, March 18, including Marvel Comics first looks, CLICK HERE. * For Wednesday, March 17, including DC Comics first looks, CLICK HERE. * For Tuesday, March 16, including DC solicitations for June, CLICK HERE. * For Monday, March 15, including DC news, CLICK HERE. * For Saturday, March 13, including Batman news, CLICK HERE. * For Thursday, March 11, including Marvel Comics news, CLICK HERE. * For Wednesday, March 10, including DC Comics news, CLICK HERE. * For Tuesday, March 9, including Image Comics' The Ride, CLICK HERE. * For Monday, March 8, including Dark Horse solicitations for June and an interview with wrtier Tony Bedard, CLICK HERE. * For Sunday, March 7, including CrossGen news from MegaCon, CLICK HERE. * For Saturday, March 6, including Hellboy and Catwoman movie news, CLICK HERE. * For Friday, March 5, including Static Shock news, CLICK HERE. * For Thursday, March 4, including Marvel first looks, CLICK HERE. * For Wednesday, March 3, including Marvel and DC first looks, CLICK HERE.